I tend to be long-winded when recapping vacations. Or I don't write about them at all. I'm going to go ahead and write about this one, if only for my own memory's sake. For the record, I ended up taking four cameras: Polaroid SLR 680, Holga, Canon SD800 IS and Pentax K1000. I also ended up not taking a whole lot of pictures. It just turned out to be a trip that wasn't heavy on the photo opportunities. We headed out on I-25 North last Saturday morning, Will behind the wheel of the 16-foot Penske truck filled with our friends' belongings. I hadn't been past Pecos on I-25 North since about 1993 when I took a road trip to Vail and Breckenridge. 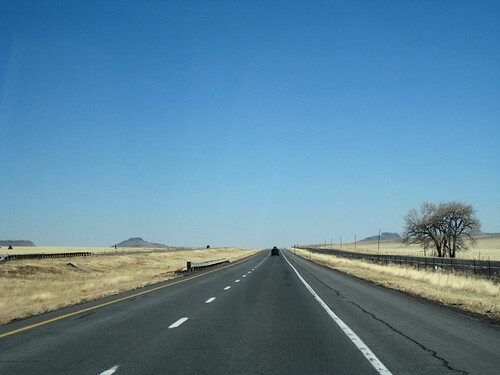 It's a pretty drive through north eastern New Mexico and southern Colorado. 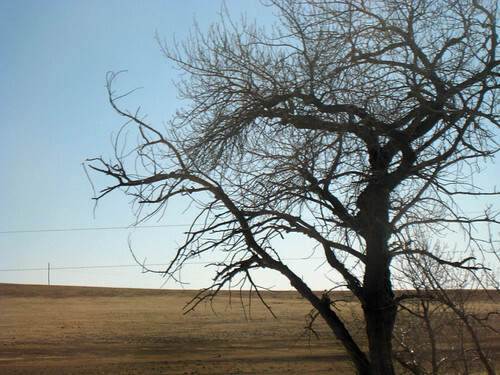 I just love the washed out pale color of winter in New Mexico and going north, it seemed even more intense. That area of New Mexico is rather flat compared to Santa Fe, although you can see the peaks of Pecos Wilderness and the Taos Mountains in the far distance. We started seeing herds of animals that weren't deer or elk but kind of looked like deer or elk. We finally decided that they were antelope. I didn't even know we had antelope here in New Mexico. Heading into Colorado, we hit the mountains again and it was quite lovely. I was content just looking out the windows at the passing landscape. Before we hit Denver, we got off I-25 and headed east on I-76. (Both of us had hoped to go through the city of Denver, but alas, it wasn't to be.) In that direction, the landscape shifted back to grasslands and cows. Pretty, but I have to admit that after awhile I got bored with the view and pulled out my knitting. We had planned to drive for about two more hours after Denver, but when we hit that mark in Sterling, it was only five o'clock and it felt too early to stop. Onward we went only to find ourselves in the middle of no man's land with exit after exit with no services. We set our sites on Julesburg, Colorado as a stopping point, but when we got there, it didn't look too appealing. A one motel exit and a closed Subway. And it was dark enough to seem vaguely menacing, like a horror movie to be. Onward into Nebraska we went. I decided to place our bets on Ogallala because I liked the name. And sure enough, it was a good one. A handful of motel choices and, even better, a restaurant that was not a chain. Or fast food! We ate at the Spur Steakhouse and it was awesome. The waitstaff was super friendly, the atmosphere had a touch of the old west to it and the food was great. 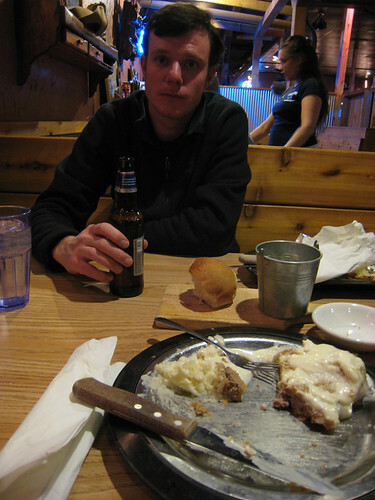 Will had a rib eye steak (we were in Nebraska after all) that he said was one of the best he's had. I went for an old favorite of mine, chicken fried steak. It was excellent. They use a light cracker crust instead of the heavy breading and it was just so good. We were happy eaters. I forget what all the motel choices were, but we went with Comfort Inn because it was a bit further away from the interstate and we generally have good luck with that chain. This was one had a rather grubby feel to it, but whatever, at that point we wanted to relax. I actually slept through the night which was a nice treat. That night we chose the Days Inn. It was vaguely less cardboard box looking than the Comfort Inn. We got caught in conversation with Mark at the front desk for far longer than our weary selves wanted but finally escaped to our slight less claustrophobic room than the night before. The sheets looked like they had been washed about a million times, as if the place hadn't bought sheets in a decade. Seriously. Clean but a little creepy. I didn't sleep quite as well that night, but it was okay. 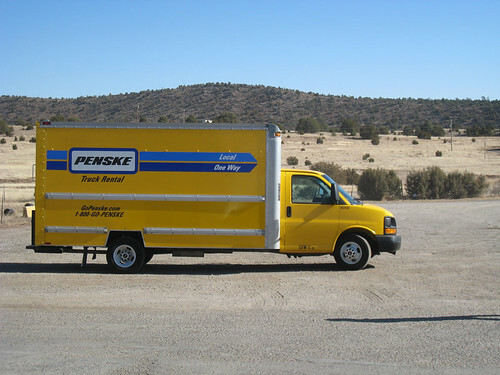 What was your real world gas mileage with the 16ft Penske truck? I am thinking of renting one to go from NY to TX. I'd appreciate it. Thanks!